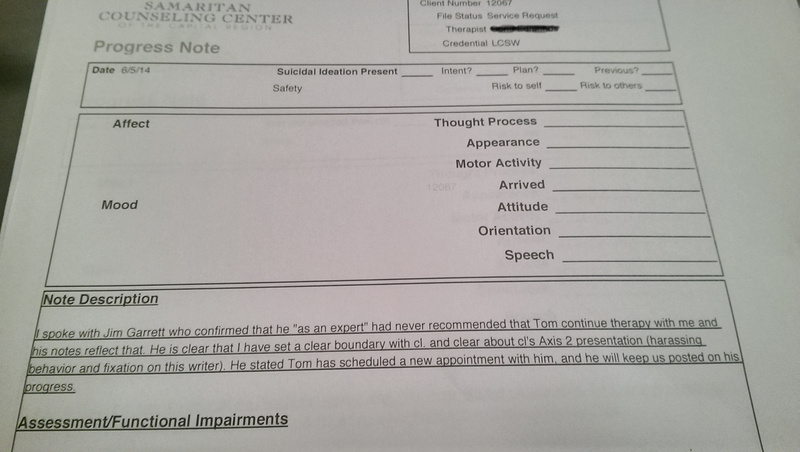 This is in my medical records, and ‘confirmed’ by the 12-step interventionist LCSW-R James Garrett, because I complained about Alcoholics Anonymous coercion at Samaritan Couseling Center of the Capital Region. My complaints, however, which led to this diagnosis, have been removed and are not ‘technically‘ a part of my clinical records, so there is not a very good record of why I am so personality-disordered or mentally retarded. 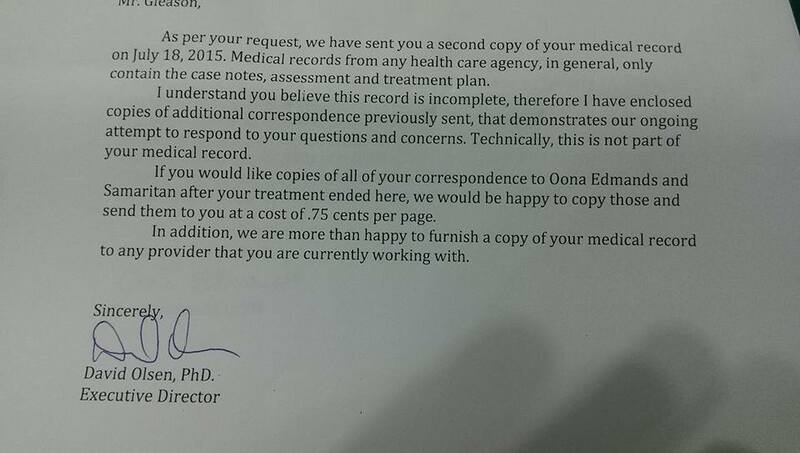 I would like my complaints to be included in my medical records but Samaritan Counseling (which is a right to request according to HIPAA law) is not responding to this request. I spent several weeks being dissuaded from asking for my records from James Garrett to compare them with the ones I had received from Samaritan Counseling. I finally demanded them, and while he had been telling me that it was her decision not to speak to me, for five months I had several indications that she was willing to speak to me but could not because I had not completed the treatment process, which seemed to be never-ending. His records show that I wanted to know what he was telling her, and this one shows it pretty clearly. This above was the last note related to my ‘progress’. Was my attempt to explain over a year of AA coercion which I found troubling. In this letter I was still trying to give the addiction specialist James Garrett the benefit of the doubt, not yet knowing what was going on and it wasn’t until a year later that I got this record saying that he had been calling me Axis 2 in the meantime and telling Samaritan to keep boundaries. 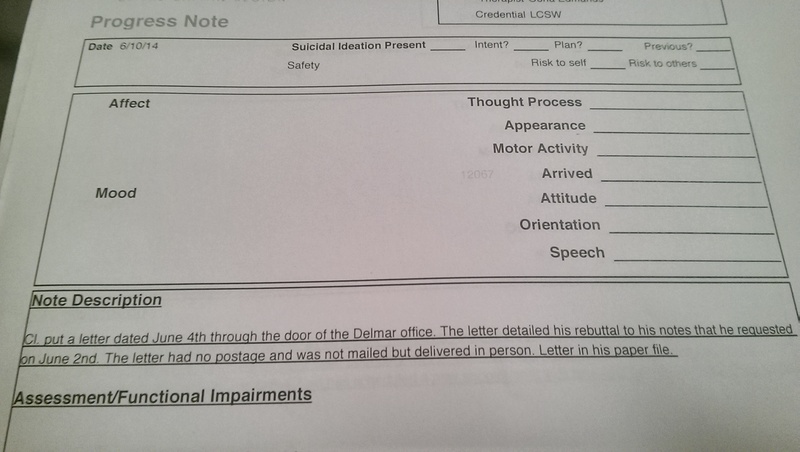 Samaritan then sent me a termination letter saying that since I hadn’t used a stamp (I hand-delivered the letter to the therapist’s office because it was closer than the post office, while mailing the other two to the Clinical Director Jenness Clairmont and Executive Director David Olsen), that I was ‘under no circumstances’ to have any personal contact with any of them anymore.